Ginger honey cake would not make a birthday cake ever probably. For most people I mean. 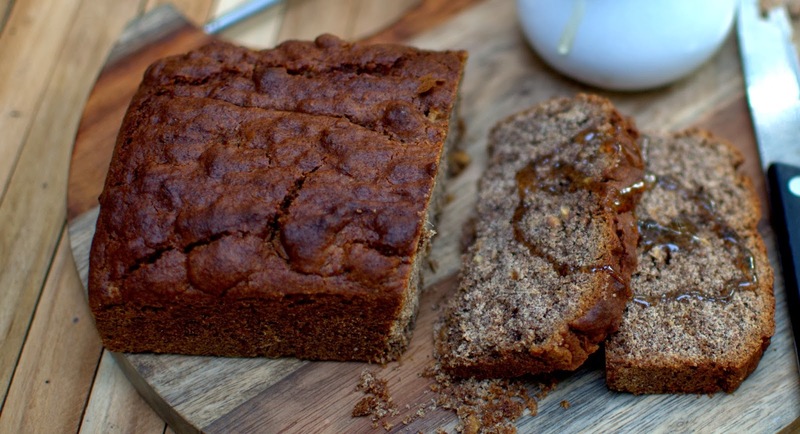 May be I meet someone who likes these flavors as much as we do but I am not quite sure if they would bake this ginger honey cake with ragi flour and not all purpose flour. Everyone wants more beautiful looking lighter cakes on birthdays but here we enjoy flavors more. I mostly go by my instinct about flavors and this time it was ginger honey cake for the husband's birthday, that too a loaf cake as we both don't care about looks that way. 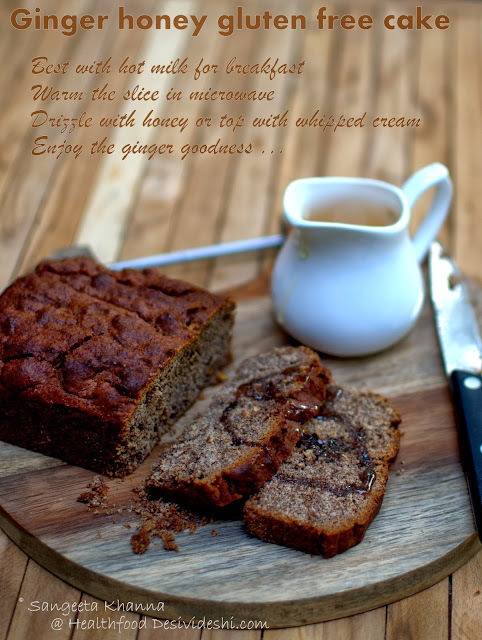 He had got a throat infection after the last trip to the Himalayas we did and as I was making him a ginger and honey tea and planned to bake his favorite dark chocolate lava cake, I changed my mind for a ginger and honey cake. I am glad I did as the cake was truly out of this world with ginger warmth and honey sweetness. .
We were climbing down from Agoda village in Uttarkashi on our last day of the trek we did last week as we quietly celebrated Arvind's birthday. We got a pleasant surprise at breakfast time when one of the fellow trekkers broke into a birthday song for Arvind and hugged him, it's always heart warming to see strangers being so warm. I baked this cake the very day we arrived home and wished that I could pass on the cake to all of them trekkers. The world is a small place and we shall meet again. Every journey culminates into sweet memories that we cherish for life. The cake was a good way to veer off the tiredness after the trek as well as take care of the mild throat infection. 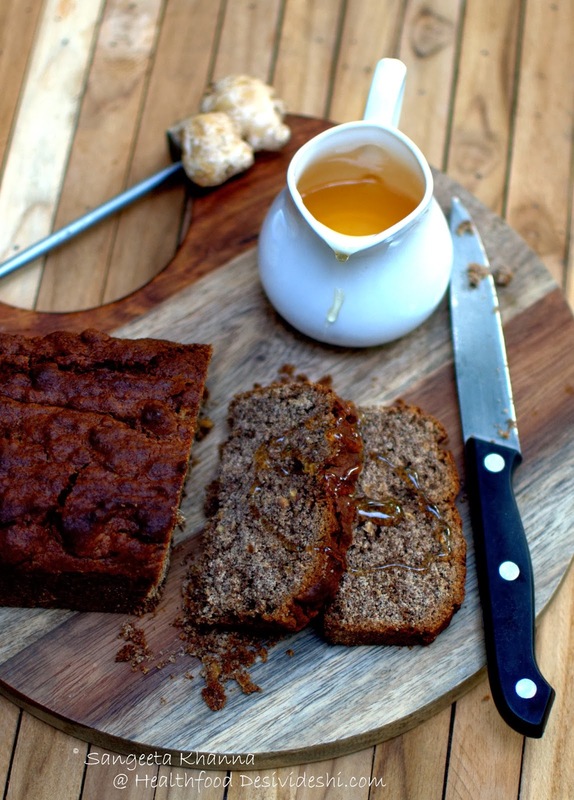 Ginger honey cakes age really well. It always tastes better after each passing day so make enough for the family so it lasts for a week at least. Soak the chopped ginger in the brown raw sugar for about an hour. 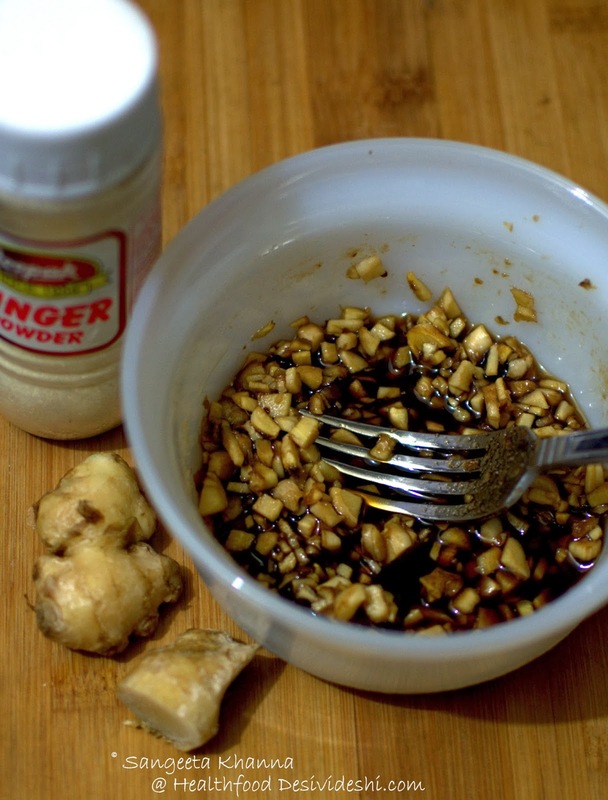 You can soak it in honey as well or use the ginger directly. 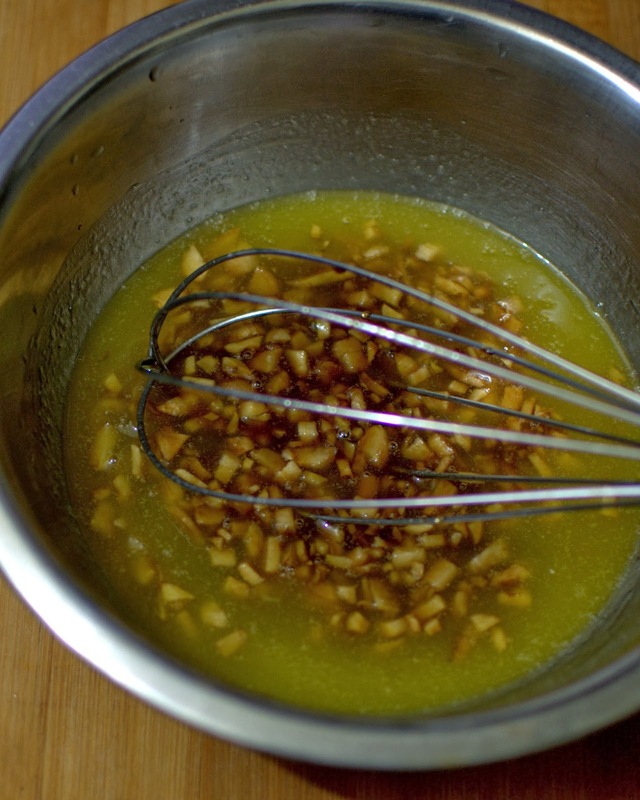 You might like to use a little candied ginger (later in the batter) to get a richer flavor of ginger in the cake. My home made stock of candied ginger was over as I had gifted it to a couple of friends. Break the eggs in a mixing bowl, melt the butter (bring to room temperature) and pour it over the eggs. Whisk lightly. 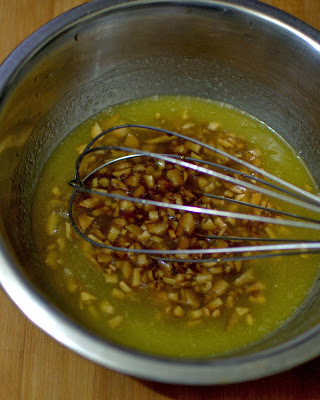 Add the soaked chopped ginger in the mixture and mix lightly. 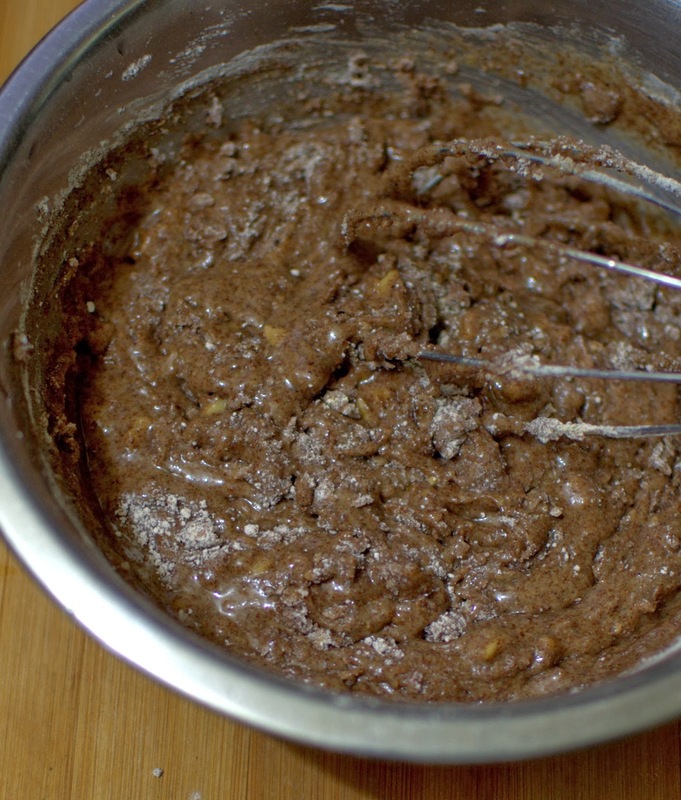 Mix the dry ingredients and tip them all in this mixing bowl. 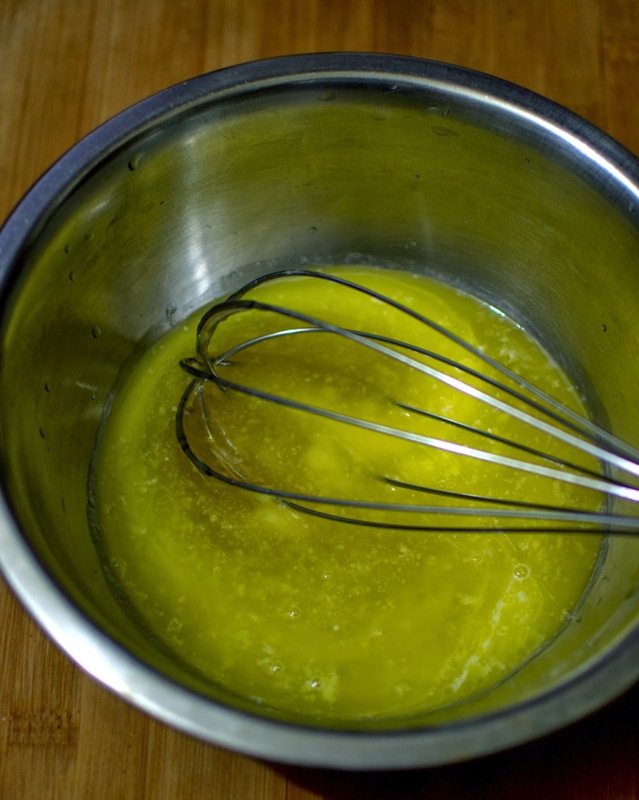 And whisk to make a batter. It wouldn't be a free flowing batter, almost like a muffin batter as ragi doesn't have the tendency to bind well. 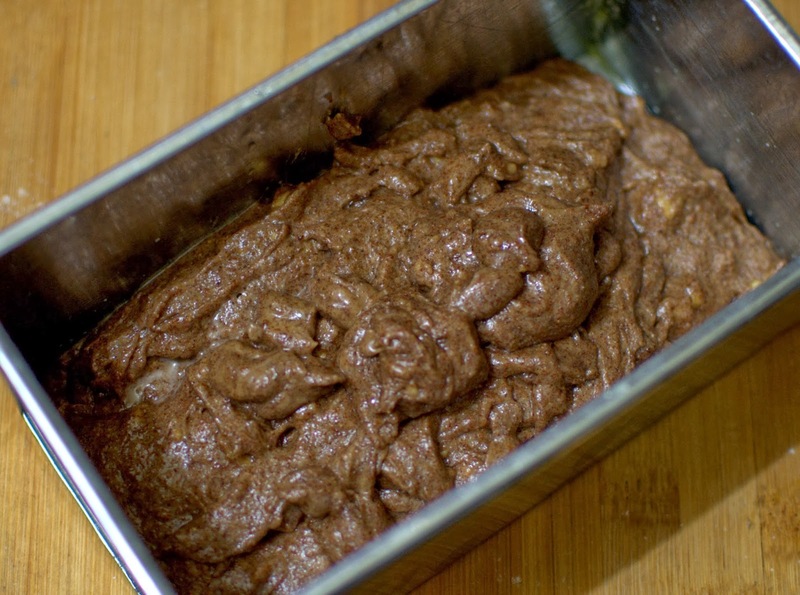 Pour into a greased loaf tin. To fill a loaf tin of ...... you need to double this recipe. I made a small cake as I already had a few leftover pieces of a chocolate cake to finish and knowing that only one person eats cake I like baking a different cake every week in small amount so there will be variety. Bake at 180 C for 40 minutes or till a skewer comes out clean. The cake has a tendency to get brown, ragi is already brown but a rich crust will be visible after baking. Few cracks are normal and you can arrange a thin line of butter strips to get a single median furrow in the loaf. I didn't do it this time. Cut slices and serve with either a drizzle of more honey or a dollop of whipped cream if you wish. Arvind loved it with his breakfast along with warm milk. I liked small half slices with hot milk. The slices would be a little crumbly but they hold well while you eat. Ragi behaves a little too differently than all purpose flour so the shape may not look perfect. But rest assured the taste will be way more rich than a wheat cake, whole wheat or refined. I feel the all purpose flour (maida) somehow kills warm flavors in a cake, although I would agree that the fruit based cakes come out better with all purpose white flour or maida. But then you have choices always. 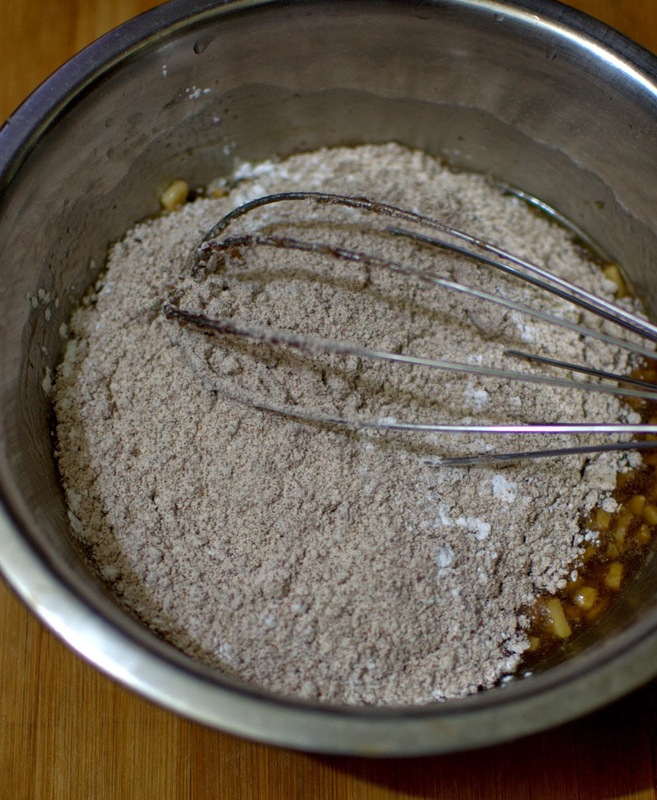 Gluten free cakes have a richer taste if you are using spices and natural sweeteners. I find more depth of flavor in such cakes as plain white sugar and white flour taste just plain boring. I found hints of the pound cake we used to bake in out childhood. The eggs and the butter make sure the cake has all the good old taste of home baked cakes and the ginger, honey and ragi add value taste and health wise both. Tell me you too like cakes made with gluten free flours. Please do. Yummy! This looks so wonderful. I am tempted to try this recipe. honey and all the spices sound really interesting. Thanks for sharing! You know it is you who inspired me to push my boundaries into whole grain. I have a bag of ragi that I bought from Fab India last week. Must make this. Sounds so interesting. While maida works well for fruit cakes, I now barely ever use it. Anything ragi and amaranth are most welcome. Thank you!! 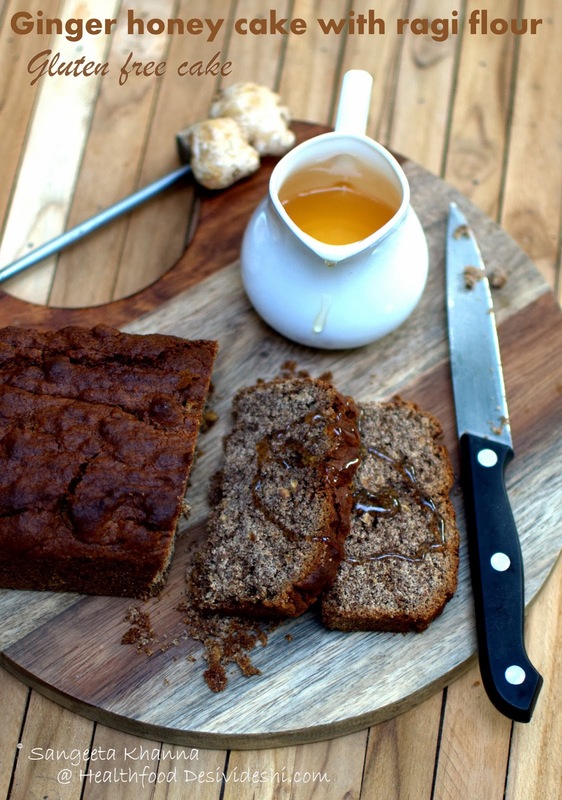 I often make ginger honey cake with atta but using raagi is really new for me. never used it for baking (other than some cookies). will try this. love your clicks. 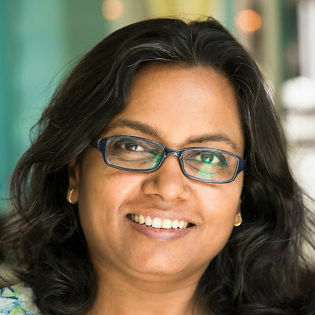 Sangeeta, such a lovely recipe! 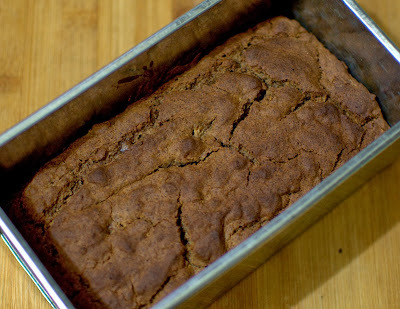 I'm a great fan of using ragi in cakes, the nutty flavour is enhanced so much more while baking. I make a similar one but I do it without eggs. Should try your version with ginger soon. Yumm! Excited to find your site. I love gluten free cooking, its so easy on the body. It's nice to recipes with an Indian twist.